Publisher's Blurb (courtesy of Harper Voyager): Late Renaissance Italy abounds in alchemy and Aristotle, yet it trembles on the brink of the modern world. Galileo's new telescope encapsulates all the contradictions of this emerging reality. Then one night a stranger presents a different type of telescope for Galileo to peer through, enabling him to see the world of humans three thousand years hence. Galileo will soon find himself straddling two worlds, the medieval and the modern. By day his life unfurls in early seventeenth century Italy; by night he is transported through dimensions of time and space no other man of his time could possibly comprehend. Inexorably, Galileo faces trial for religious crimes in his own time, while in the new world he discovers, where science assures men that they can perform wonders, but does not tell them what wonders to perform, he is revered. Galileo's Dream is, first and foremost, a masterclass in how to write historical fiction. Much of the novel is based in Renaissance Italy, following Galileo at what most consider to be the height of his fame before he is embroiled in disputes with the Church. Life in Italy, the importance of religion, the baby steps being taken towards scientific understanding - all of these are brought to glorious life, with wonderful descriptive passages and the use of Galileo's letters to enforce the events he was living through. I confess that I would have been hugely satisfied with an historical novel that purely explored the life and times of Galileo. Kim Stanley Robinson, however, intersperses the historical passages with brief visits to the far-flung moons of Jupiter - Galileo travelling through both time and space to discover the colonised moons in 3020. To begin with, these passages felt as though they were shoehorned into the novel in a clumsy fashion, with the reader suffering the same confusion as the Galileo of this novel must have suffered. The passages set in the future were roughly sketched, the worldbuilding not living up to the meticulously researched historical sections. Eventually, you become used to the rough transitions, but I never enjoyed them, and I grew frustrated at the fact that each time Galileo returned from his future visits, his memory was partially cleared of events experienced in the future. As well as the excellent historical sections, for me the greatest strength of this novel - the factor that gave it both humour and heart - was the stunning characterisation of Galileo Galilei. This is a man who infuriated many of his contemporaries - arrogant, stubborn, opinionated. A man who was liable to forget the day to day running of his household, who was able to commit his daughters to difficult lives. And yet also a visionary - a towering historical figure who gave so much to the world of science. All of this, and more, Kim Stanley Robinson manages to commit to paper - Galileo lives on through this novel. Ultimately, then, Galileo's Dream is a richly rewarding read that I thoroughly enjoyed. My main issue with it is the pacing created by the dual storylines - this caused me no end of frustration because, at heart, I felt this should have been a straight historical novel. I would recommend this book to those who have even a passing interest in the progression of science. It is excellently written and the "frustrated genius" of Galileo takes centre stage. 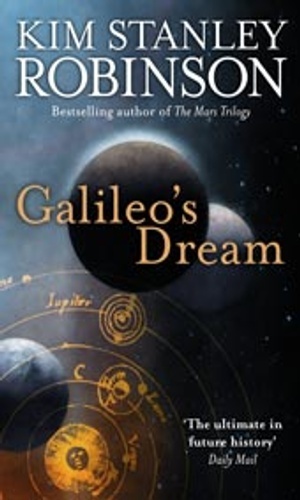 Arthur Clarke thoughts: Hmm, Galileo's Dream is yet another solid entry into the short list of six books - and, once again (I feel I am constantly repeating myself in these short analyses) it is a completely different novel from the other five. It brings the science to science fiction, in this case - exploring actual science as well as taking us on a space opera journey to future worlds. It is massively deserving of its place as a finalist, not least of which because this novel shows the continual fascination with science that gave us science fiction in the first place (I think I have expressed that in a rather clumsy manner - but it is the truth that without men such as Galileo and Newton, we wouldn't have such a desire to look at what might be achieved through the use of science). Kim Stanley Robinson's enormous affection for his subject matter shines through, and gives us a novel which is possibly the most honest of the six. I don't think it will win - but I secretly want it to.